DNA Tests Find Subway Chicken Only 50 Percent Meat, Canadian News Program Reports : The Two-Way The CBC's investigative consumer show Marketplace ordered the DNA analysis. The sandwich chain unilaterally denies the accusation, with a spokesman calling the claims "absolutely false." Tests on Subway chicken sandwiches in Canada have concluded that Subway chicken was only half meat — with the other half soy. A Canadian investigative consumer program ordered DNA analysis of several fast-food chicken sandwiches and concluded that Subway chicken was only half meat — with the other half soy. The sandwich chain strongly rebuts the allegations, with a spokesman calling them "absolutely false" and calling for a retraction. The tests were conducted by a DNA researcher at Trent University's Wildlife Forensic DNA Laboratory, for a CBC Marketplace episode dedicated to testing fast-food chicken dishes, and have not been independently confirmed. But Subway's dishes were an outlier. "The oven roasted chicken scored 53.6 per cent chicken DNA, and the chicken strips were found to have just 42.8 per cent chicken DNA," the CBC reports. "The majority of the remaining DNA? Soy." Last week, Subway told the CBC that Subway Canada "cannot confirm the veracity of the results of the lab testing you had conducted." Chicken strips and roasted chicken at Subway contain "contain 1% or less of soy protein ... to help stabilize the texture and moisture," the company told the CBC, and it promised to "look into this" with Subway's supplier. On Wednesday, a Subway spokesperson more emphatically rejected the CBC's claims. "The accusations made by CBC Marketplace about the content of our chicken are absolutely false and misleading. Our chicken is 100% white meat with seasonings, marinated and delivered to our stores as a finished, cooked product," the spokesman said in a statement sent to NPR. "We have advised them of our strong objections. We do not know how they produced such unreliable and factually incorrect data, but we are insisting on a full retraction." The CBC Marketplace report raised a larger issue, beyond the question of Subway's chicken makeup. In general, according to the report, the fast-food chicken tested had "about a quarter less protein" than home-cooked chicken, and sodium levels "seven to 10 times what they would be in a piece of unadulterated chicken." "People think they're doing themselves a favour and making themselves a healthy choice" by picking chicken, a nutritionist told the CBC. "But from a sodium perspective you might as well eat a big portion of poutine" — that is, the Canadian dish with french fries, gravy and cheese curds. Both Subway and Marketplace are sticking firmly to their stories. 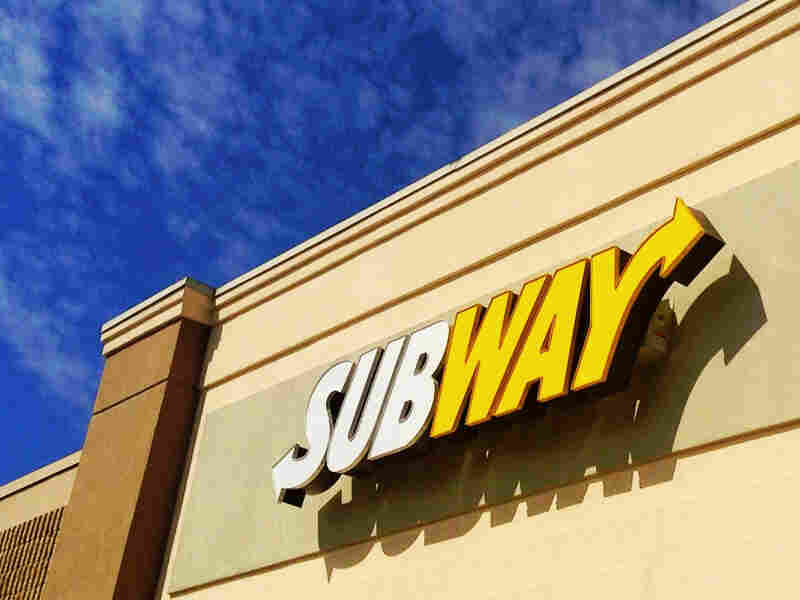 A Subway spokesman says that the company has sent samples of its chicken products to "two independent laboratories" for testing, and that the labs found less than 1 percent soy protein in the tested samples. Subway did not respond to NPR's inquiries about the number of samples, or how they were selected. "The allegation that our chicken is only 50% chicken is 100% wrong," Subway president and CEO Suzanne Greco said in the statement. Marketplace, meanwhile, says it "stands by its report" — as does the lab that did the testing — and the show has released "additional detail about the methodology and investigation." "DNA tests don't reveal an exact percentage of the amount of chicken in the whole piece, but DNA experts have told Marketplace that the testing is a good indicator of the proportion of animal and plant DNA in the product," the CBC writes.